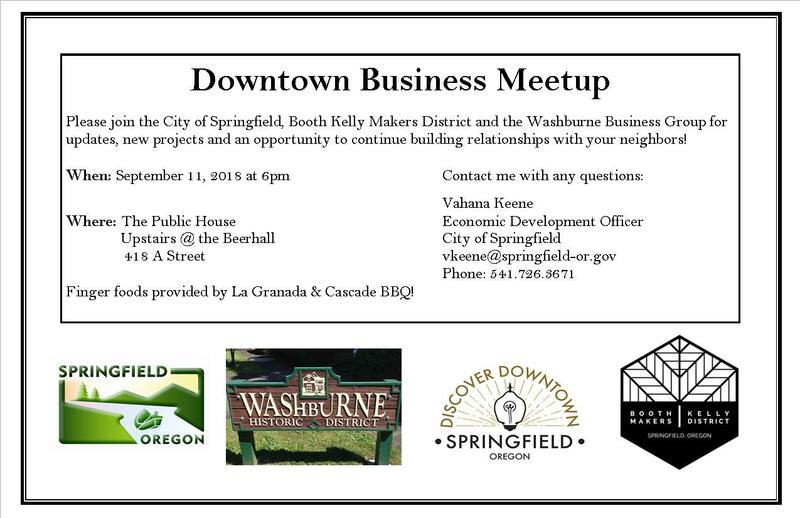 Please consider joining the City of Springfield, Washburne Business Group and the Booth Kelly Makers District for a meetup on September 11, 2018 at The Public House. We will provide light refreshments from La Granada and Cascade BBQ, gather ideas and talk about downtown events, social media and what is upcoming in downtown. This will also provide a great chance to meet our growing business community and spend a bit of time your neighbors! Please reach out to me if you would like to offer an update or would like to share something with the group. As always, there will be time to chat, make connections and ask questions of City staff and neighbors.